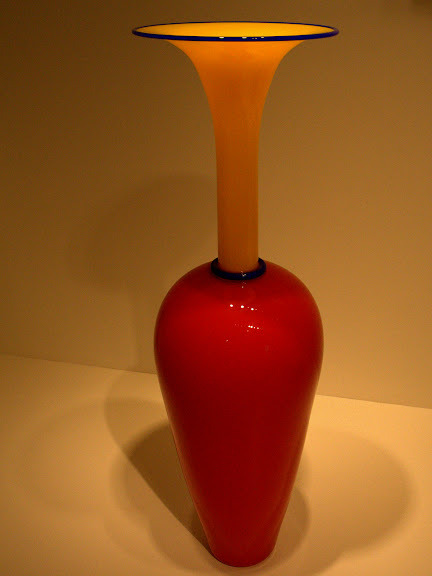 The Chrysler Museum of Art in Norfolk Virginia has an amazing collection of art glass including this piece entitled Whopper by Dante Marioni. At 44 inches tall, this elegant vase is the largest blown glass object in the museum's vast art glass collection. The Chrysler is participating in "Art of Glass 2" a multiple venue show running throughout southeastern Virginia this summer. It has a great temporary exhibit of art glass by Lino Tagliapietra. Canon 40D, 1/250 sec @ f/5.0, ISO 800, 17mm focal length.